This is 2k on the dot, and looks to be quite balanced for the Ruinous Powers. With multiple Large Blasts each turn, along with a good amount of Walkers that can tie weak units up, 6 Multi-Meltas with a potential of 4 different targets, along with 5 Troops that have decent assault capacities, this looks to be a nice list to put on the table. Note: Much of the inspiration for this list came from Stelek over at Yes The Truth Hurts. You can see his list over on the site, and it was he that pointed out the difference in the Chaos Dread's Crazed rule. As some of you may know, a fellow blogger named Fritz has proposed the philosophy of "living in the future" when it comes to playing 40k. He proposes that one should discount any non-fifth edition codices when you are planning how you will build and play your armies, based on the idea of a trend in fifth edition codices to do one thing or another. I may be biased, but I think Fritz is on to something. The fifth edition codices do tend to have some things in common, generally lower points costs, improved psychic powers and at least one shiny new "must take" unit for instance. As I am a follower of the "take all comers" school, The idea of thinking in generalities is not entirely forgien, but I too get caught up on particular codices and my difficulties against them. What I'm trying to get at is answering the question "how do you plan for all armies?" Well, the answer can only partly be found in your opponent's new "overpowered" codices, mostly it can be found in your own. Sun Tzu said "He who knows when he can fight and when he cannot, will be victorious. " I know this is only a game, but the principle applies. What you need to ask yourself is "how can my army fight"? Is your army mobile or is it static? Can it fight at range or up close? If you know these answers, you are half way to solving the problem; you when you can fight. Knowing when you cannot fight is not always as simple, especially when playing against newer codices. The horror squad that was nob bikers can still chew on most enemies, but should they charge a swarmlord with guards or a trygon? 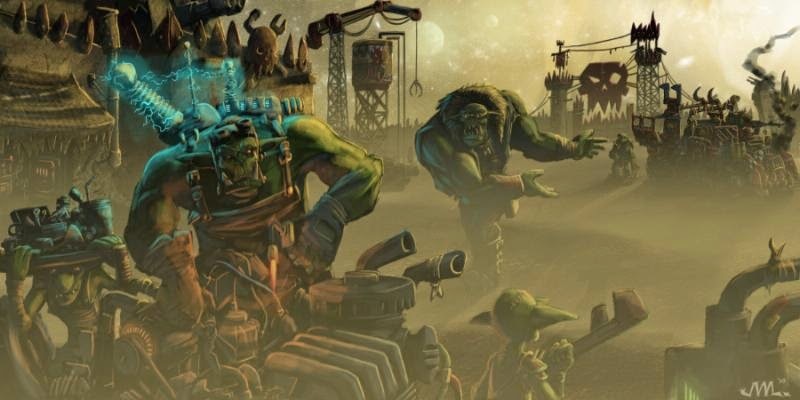 There are situations when Tau will be out shot and orks out assaulted, and we need to deal with that reality. But how can we deal with being forced into a situation we do not want to be in? Each army has its own answers built in and it would take too long to detail them all here, but let me leave you with this last thought. Your codex is like a surfboard you use to combat the other codices. It may be unbalanced, it may not be exactly up to par, but it's still a surfboard. Polish your surfboard and reread your codex. There are little knots in the wood, units you never thought were worth taking. Maybe they aren't imperfections, but a part of the board you haven't yet gotten the hang of. With the right know how and an adaptable mindset you can get on a new part of your surfboard and ride the wave of fifth edition right on the crest. Hey guys, Loki here with my first true post. "My oh my" wonders the reader, "What could this be about?" Simple says I, the ability to think your way to victory and of course look at all the wording on rules is paramount in gaining a slight edge over your opponent. Especially if they are seasoned veterans or players who know how to run their specific army well. Today, I bring to you all a favorite tactic I have picked up while playing in 5th edition. As I run Space Marines, I generally know I will not be great at any one thing, however some units are, simply put, great. My example here is my ever popular Assault Terminators. As 4 of my 6 are equipped with Thunder Hammers and Storm Shields, they are a hard hitting unit that scare even the most grizzled and seasoned of players. But how does one get these infantry models into combat as soon as possible. The most obvious choice (aside from Deepstrike) is the Land Raider. Keep in mind now that this tactic will work great with most transports, but due to the scale of the actual Land Raider model, as well as the impressive 14 all around armor it has, it makes it the prime choice for using this tactic. So how is it done? I will explain with no further delay. When placing units in your deployment zone you have a front line. For this example we will use pitched battle scenario, but it will work well in all set ups except dawn of war. All you have to do is place the Land Raider along your front line on its side. This is everything. If you read the rules in the vehicle movement section, you will see that it mentions pivoting. A vehicle may pivot as many times as it wants along its path, and does not count as additional movement. So all you have to do is once you start your turn, you pivot the Land Raider 90 degrees to face forward. Now, you tank has an addition 3 inches from your front line. So with a 24 inch gap now reduced to 21, the tank moves up 12 inches, reducing the gap further to a distance of 9 inches. Now you disembark. This is another moment when you must read the rulebook and examine all of the diagrams very thoroughly. As it shows when you disembark, a model must simply be touching the imaginary 2" line. This means that you measure the 2 inches, place the model so the entire base is outside the 2" arc, but so long as it is touching the line. this means that 9 inch gap had been reduced not only by 2, but a further 1.5 inches adding in the width of the Terminator base. doing the math, that puts the gap down to 5.5 inches, allowing a turn one charge from the Assault Terminators. Now of course the enemy has to be close to the same section of the board as the tank, and on their front line. But believe me it is not a stretch for that to happen. I have utilized this strategy many... many times and it has yet to fail me. Every turn a unit like that sits in a transport is time wasted. The faster you can achieve a charge the better, unless you intentionally want them inside for late game purposes... However, moving this is a strategy for assault style play. I hope this tactic will come in handy for those of you out there trying to get their killy death squad (KDS) into CC faster. As a Tau player, I'm familiar with their unique strengths and weaknesses, namely shooting and close combat. Having played against marines several times I had come to realize they were better than my Tau in close combat, but fell short in shooting. Watching games of marines fighting the Tyranid menace, I saw how the marines were able to outshoot the bugs, but couldn't stand up in close combat. How could an army that was being out classed in one way or another possibly be able to be worth while, I thought. That's when it hit me. When I was in a shootout with marines, I was generally better, but they held their own. When the marines tangoed with the bugs, the bugs were better, but the marines were able to hold their own again. The marines weren't close combat specialists, nor were they ranged specialists; nor were they incompetent shooting at an opponent or when fisticuffs were called for. The marines did not have any overwhelming superiority, but they have no crippling weakness either. The strength of marines, in my opinion, is their ability to adapt to any situation and be able to fight their way out. The standard battle brother is able to be used in a variety of different roles, but choosing the role for the squad requires the commander to consider the situation carefully. Sometimes the choice is clear and simple; hit the shooty things and shoot the hitty things. The ability to do either well, not necessarily excellently, but well is the strength of a marine and a quality that can forgive tactical errors by a commander. Strive always to make the best choice given the situation and leave the rest to the dice. Lascannons and Meltas, oh my! How far along are we in to fifth edition? Lackeys of the false emperor date it to over one year and a half ago, yet people are still taking Lascannons on certain units when they should be taking any Melta weaponry their codex has. I shall allow what little command of Mathhammer I have to show what I mean by this. Your Lascannon is str 9, your Multi-Melta str 8, so it looks like the Lascannon is better in range and power. However, that little rule on half distance with Melta weapons makes all the difference, with that weapon penetrating a Land Raider on average. So the Melta needs to be at half range, so what? Mount that thing on a Walker or a Fast unit, and all of a sudden you have a terrifying bubble of rolling on the penetration table, with the final kicker being the +1 on the damage chart the Melta weapon has now for being ap1! But what about the superior range of the Lascannon, as well as its higher strength? Alright, let's break the Lascannon down. For these purposes I assume Marines shooting. To get a single penetration on a Land Raider, you need six Lascannons to hit it. We will ignore the glance. With Marines firing, that just cost 8 Lascannon shots (33% miss on marines, so eight shots gives you six hits). So to help the odds, let's double that to 16, and call it a day. What statistically takes three Melta-range shots, factored in for accuracy, takes a ridiculous amount of shots from its opponent, and this is with Marines shooting, Dark Gods help you if you're firing with Guardsmen. In short, stop taking so many Lascannons in your Marine army, take Melta guns! Cheaper, more effective, scary as hell! Heck, I'm updating my Chaos Marines to actually get rid of my two Land Raider transports (because that's all they are for Chaos) because of this, which has only been compounded by the new Tyranid 'dex's Zoanthropes. Lascannons lose! Good day sir! Hello everyone, Loki here. I guess I should introduce myself a little as I am a part of this blog too. As Ishamael stated, I am a devout marine player, and I have been since the days of second edition. 40k has been more than just a hobby for me. In fact, I can't remember a day that I didn't check GW, BOLS, 40k Radio (if you don't listen, you really should), or some other 40k related site. As for my army of choice, my heart lies with the Crimson Fists. Everything from their fluff, to their paint scheme... I just love everything about them. I must say, I haven't been to keen on 5th edition forcing Sternguard on us CF players, but I make it work alright for myself so I can't complain to much. I will post a few pictures from my army. I will say it here and now that I do put love into all of my models, but I am a centerpiece guy. I love those models that just stick out. Whether it is an HQ model or a dreadnought... I just love them for their unique qualities. You may also notice that all the marines in my army wear helmets... I suppose it's just a personal feeling that all marines should wear helmets... especially since Crimson Fists adhere to the Codex Astartes more than any... save the ultrasmurfs. Either way, I look forward to bringing you guys a unique and friendly blog along with my fellow masters. Until next time. As of 11/11/11, Loki has renamed himself Godfrey to Honor his Black Templars. Rites of Battle is a blog that will be based on the Warhammer 40k tabletop wargame with three contributors (Ishamael, Underground Heretic, and Loki) putting up ideas and musings on our favorite hobby. There will be extras, such as board games and video games, as well as a nice pile of skulls to make myself a throne with. Expect regular updates with each person having his personal focus, where Loki is Space Marines, Underground Heretic is Tau (soon to be Marines), and Ishamael is the Ruinous Powers.